- Only HR employees can access the HR department network. - Users should not be prompted for login information. Which firewall solution can be used? 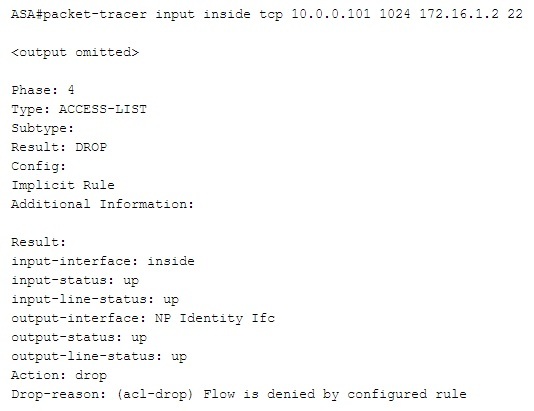 A. Configure per-user policies using Cisco ASA cut-through proxy feature. B. Configure the Botnet Traffic Filter. C. Configure Cisco ASA Identity Firewall. D. Configure a reputation-based Cisco ASA access policy. The Cisco ASA 5500-X Series Next-Generation Firewalls provide four main remote access protocols to access the adaptive security appliance management functions. Which remote access protocol uses X.509 certificates for authentication? A. External client 10.2.2.9 has permanent FTP access to internal server 172.31.2.3. B. Server 172.16.1.8 can only be accessed from 10.1.1.2 via HTTP during working hours. C. Client 10.1.1.2 can always use HTTP to access external server 172.16.1.8. D. Client 10.1.1.2 has SSH access to 172.31.2.3 during business hours only. E. External server 172.16.1.8 can be accessed via SSH from 10.1.1.2 during work hours. A. HTTPS access has been configured. B. HTTP access has been configured. C. SSH has been allowed on the management interface. D. An OOB Management Interface has been configured. Examine the output in the exhibit. What can be concluded based upon the output? A. The connection is blocked because Telnet has not been configured properly. B. The connection is blocked because NAT is not configured properly. C. There is no connectivity issue. D. The connection is blocked by a configured interface access rule. You need to enable strict uRPF and allow the router to ping its own interface. Which command should you use? Examine the output in the exhibit. You are troubleshooting the syslog message displayed in the output. Which severity level is outlined within the syslog message? Which command enables the Cisco ASA to display syslog messages for SSH sessions? You are looking at how the Cisco ASA supports application layer inspection for many other application layer protocols. You plan on implementing TrustSec in the network infrastructure. What statement best describes its use? A. Isolate same VLAN ports. B. Defend against ARP spoofing. C. Harden overall network security. D. Prevent STP operations from being influenced. A network administrator has configured the DHCP snooping feature on a switch. Which command can be used to determine the interfaces that have been trusted and the rate limit configured on them? Which command would provide information about NAT sessions and how the configured NAT rules are being used? Which command can be used to verify that secure management access protocols are configured on a Cisco IOS device? Identify the reputation-based mechanism used to prevent traffic to and from hosts known to be infected. Which command is used to verify PVLAN associations? Cisco MPF provides granularity and flexibility when implementing network policies for traffic flows. Which logging severity level indicates extremely critical "system unusable" messages on a Cisco device? A. It is recommended to allow SSH versions 1 and 2. B. It is recommended to only allow SSH version 2. C. Idle time values may range from 1 to 60 minutes. D. The default idle time is 10 minutes. You are going to implement Cisco MPF to provide granularity and flexibility when implementing network policies for traffic flows. Which ASDM-defined user role is provided with privilege level 5 only?